Ypsilanti, MI (May 24, 2018) — Following a March 9th Washtenaw Metro SWAT raid on a suspected drug house in the city of Ypsilanti, Washtenaw County Sheriff’s Office (WCSO) Animal Control seized four puppies and five unsterilized adult dogs living in unsanitary conditions. Many of the adults were confined by wire cages in a basement stained with urine and littered with feces. One, a pregnant female, was lying under a bed. The animals were transported to and have been under the care of the Humane Society of Huron Valley (HSHV), pending the criminal investigation. The owner continually declined to surrender the dogs, assuming responsibility for all boarding fees and any required medical treatment. Two days following the raid, the pregnant dog gave birth to 10 puppies. On several occasions, she was advised of the accruing charges but insisted on maintaining ownership. 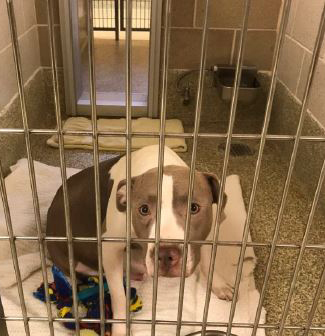 At the initial court date for the criminal and animal cruelty case on May 16, a forfeiture hearing was held, Judge Kirk Tabbey of the Ypsilanti City 14A-2 District Court residing. Having accrued over $35,000 in charges for necessary medical treatment and care for the 19 dogs, the dogs’ owner was given the opportunity to proceed with hearing, with the understanding she would need to provide payment to HSHV for incurred costs. The owner decided to forfeit them to HSHV, where they will be made available for adoption. The defendant’s pretrial is scheduled for June 13. “A big challenge in pursuing animal cruelty charges is the lengthy sheltering time often required. Animals are not meant to live in shelters — even beautiful, caring ones like HSHV. It’s difficult to keep them healthy and happy over many months and to provide the intensive care puppies need to become well-adjusted companions. We are extremely grateful that Washtenaw County’s Prosecuting Attorney Brian Mackie and his team were willing to pursue civil forfeiture and for Judge Tabbey in presiding over the forfeiture hearing. Now they can find the loving families they deserve,” said Tanya Hilgendorf, HSHV’s President/CEO.